Every time we go to the store that sells the produce from the hills, I am tempted to buy water mill crushed fresh cornmeal that is coarse and smells like heaven. I have already used a lot of it in Wholewheat and maize bread, Anadama bread, and Overnight cornmeal rolls. I have started liking its strong flavour and texture. 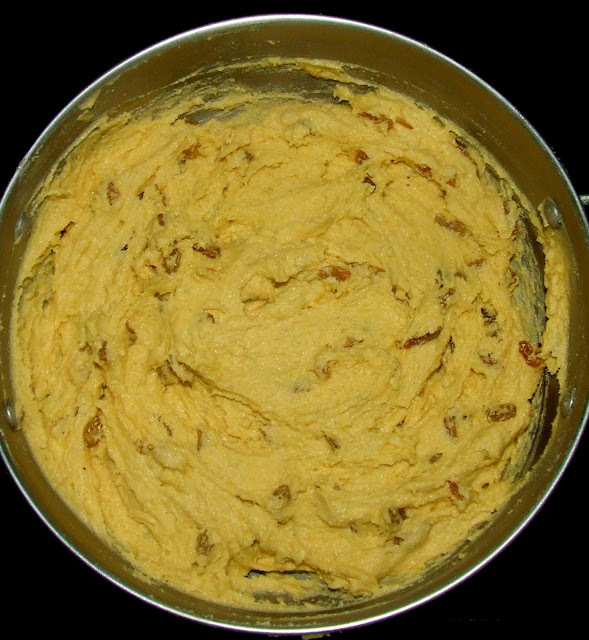 It imparts a unique, its own kind of taste to the bakes it is used in. Perhaps it is the love for the hills or having our roots in the hills that translates into love for anything that is grown in the salubrious weather of the hills. Having procured another pack, I wanted to use it in cookies, which I had discovered long back in David Lebovitz's site. David’s site is full of treasures for those who love bakes, chocolates and ice creams. 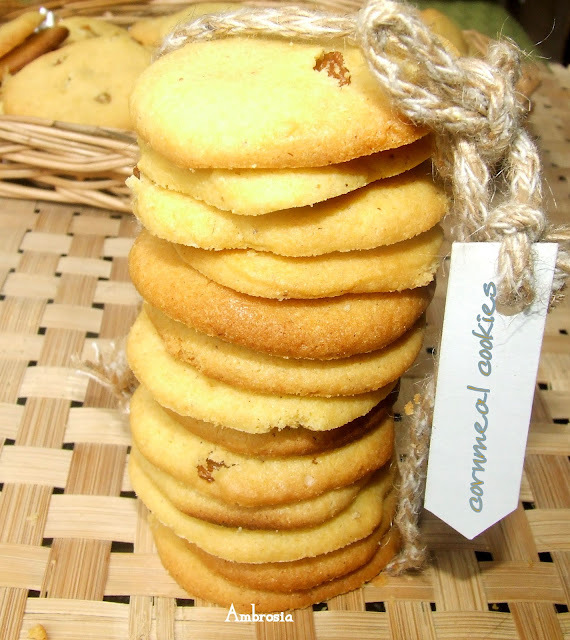 The cornmeal cookies were delicious and came out well. However, there are small proportions that always need adjustments to tune the recipe to individual liking or taste. David’s recipe asks for ¾ cup of raisins. In my case, the raisins started popping out of the cookies in the final stages of baking. 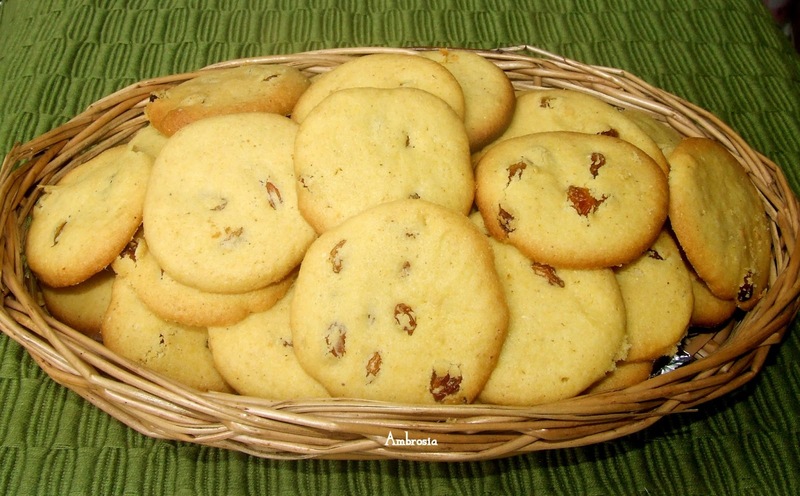 In the next batch, I used just ½ cup of raisins that worked fine. I used salted butter so reduced the quantity of salt from ¾ teaspoon to ½ teaspoon. Also, the cookies should be thin and evenly spread. Bake the cookies exactly for 12 minutes or when the cookies start changing colour, turn off the oven. I did not freeze the dough. I just chilled it. I would recommend that you visit David’s site and read the original version. This is how I made cornmeal cookies. 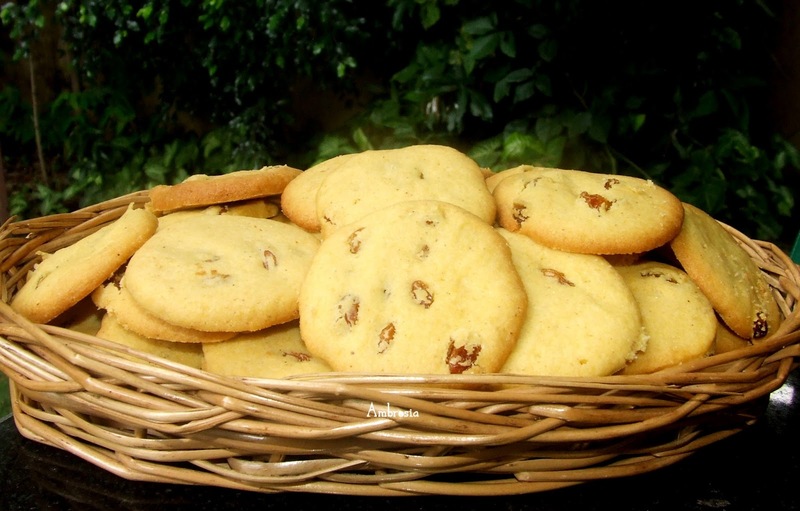 Toss raisins in flour and keep aside. Beat butter and sugar till creamy. Add eggs one at a time, beating well after each addition. Add vanilla essence. Mix well. In another bowl, whisk together flour, cornmeal, baking powder and salt. Mix dry ingredients into butter sugar mixture. Mix well. Add raisins. Keep the dough in the refrigerator and chill for an hour. Pinch pieces of dough about the size of walnut, roll into ball and flatten them. The cookies should be thin and placed with some distance between them. Bake the cookies in a pre heated oven at 170 degrees C for 12 minutes or when the cookies just begin to change colour on top. Remove from the oven. Cool and store in an airtight container. I love David's recipes and his blog is truly a treasure trove for baking maniacs like us:):) Loved the cookies and the bits of raisins in it. Thank you again for linking such an amazing recipe. what would the indian term for cornmeal be? hello! Cornmeal is makki ka atta. It is commonlyavailable in the stores.